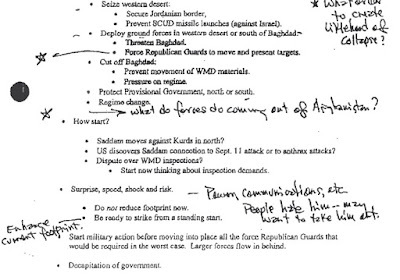 Recently de-classified documents (open a pdf of the documents) now prove, definitively, that the Bush Administration lied about when - and how - they came to the conclusion that Iraq was an "imminent threat" and therefore, the effort in Afghanistan had to be put on the back burner. 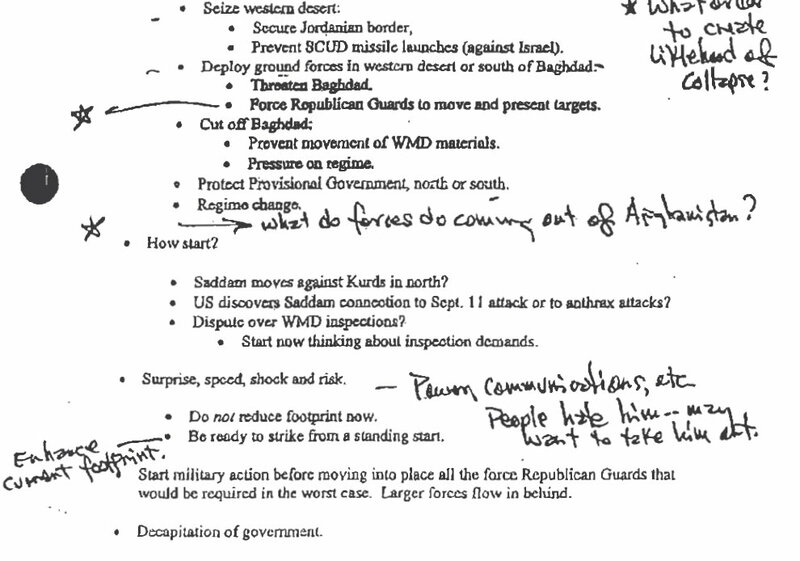 In a meeting in November 2001 between Defense Secretary Donald Rumsfeld and CENTCOM Commander Tommy Franks, the two began fleshing out their made up rationale for invading Iraq. As you can see from the picture above, in the section entitled "How start?" Rumsfeld came up with three potential rationales for an invasion (each phrased in the form of a question): 1) Saddam moves against Kurds in the North? 2) US discovers Saddam connection to 9/11 attacks or to anthrax attacks? 3) Dispute over WMD inspections? -- Start now thinking about inspection demands. There you go, folks. Despite the Bush Administrations claims that a decision to go to war in Iraq was not made until days before the invasion, and that they did "everything" they could to avoid war, the decision had been made shortly after the 9/11 attacks. Even though the Administration knew with 100% certainty that Saddam Hussein was not involved with 9/11, they were still floating the idea of saying he was to justify the invasion. And before there were any WMD inspections, Rumsfeld was already set to "dispute" the findings when they eventually happened. Note also how the idea of taking troops out of Afghanistan and moving them to Iraq was put into place here, as well. The entire thing was based on a lie. That is not this, or any other, writer's opinion. There it is in black and white from the administration itself. Spin away, righties. Dave, if this document is authentic as to the purpose you purport it is, then I admit that I was wrong regarding Bush. The only thing that comes to mind as a possible alternative is that it is the job of the Secretary of Defense and National Security Advisor, Joint Chiefs, etc to try and predict possible scenarios with belligerent nations and devise a means of addressing these issues. If that was all this document is, then it is understandable and not the smoking gun you think it is. I sure would like to know the context in which it was written though to be sure. "If" it's authentic? Man, your denial runs very deep, my friend. The documents come from the National Security archive, and were obtained through a Freedom of Information Act request. The documents are authentic, and if you read it, the context would be obvious. Sorry to burst the bubble you've been in since 2002, but the Iraq War was based on a lie, and it was a forgone conclusion as soon Bush got into office. There is simply no way to deny it any longer. Dave, I was not questioning the authenticity of the document, but rather the purpose and context in which it was written. Is it a document placed together in a hypothetical scenario as a part of a threat assessment by a belligerent nation, or is it brainstorming to justify going to war as you think it is? It's exactly how I characterized it. And wondering how to "start" a war hardly seems like normal threat assessment.